Harmor, over a year in the making, is finally here! Gol said 'No discounts' but while he was out we put it ON SALE for $99! 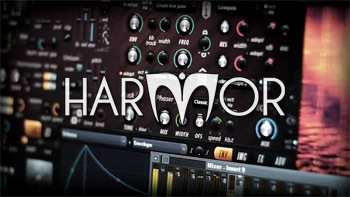 Sale ends October 1, Harmor will be $149. Deckadance has been updated with improvements to the Song Manager including many usability enhancements and now with star ratings system. Deckadance continues to expand its reputation as the most open and flexible DJ Mixing application in the industry. Deckadance offers open support for the widest range of Time Codes (DVS CD/Vinyl) and compatibility with all MIDI compliant controllers. FL Studio on a Mac? Beta testers wanted. We are currently testing a version of FL Studio that runs natively on Mac. No need for Windows or Boot Camp. We need Beta Testers! If you are an experienced FL Studio user (with a registered copy) AND have access to a Mac, please click on the image above and apply to get a copy of FL Studio for Mac and start testing. EZGenerator is our very own website development program . Version 4 brings all the rich multimedia & social-media web-development tools you need. EZGenerator is perfect for musicians/bands/labels wanting to set up their own website. Complete with e-commerce (shop) pages. EZGenerator is the tool used to develop all our web sites (Image-Line, FL Studio, Deckadance, EZGenerator e.t.c) including this Newsletter. Why not download the trial today and give it spin. See how easy it really can be! Check out Groove Machine, our up-coming performance oriented Groove Box currently in Beta Testing. Release due October 2011. Got an Pod touch, iPhone or iPad ? 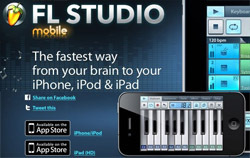 Then check out FL Studio Mobile and see what all the fuss has been about. Compatible with FL Studio for Windows too.